Nestled in the atrium of the Questrom School of Business, a herNetwork booth has pens and flyers neatly stacked and organized. An open laptop rests on the table, and the club’s president sits behind it preparing for a networking event, greeting students as they hurry in from the cold. The club’s website describes herNetwork as a “women in business club which serves as a networking and mentoring group.” They host weekly information and networking sessions on Tuesdays for members to learn about different companies and their employees. Boston University and herNetwork alumni also come and speak at some of these events. HerNetwork hosted employees from Accenture, a consulting firm, at Questrom Tuesday to share their experiences in the company and stories about finding their rhythm and adjusting to a new workplace. Accenture offers services in a variety of fields, including strategy, technology and consulting. Kimberly Tam, herNetwork’s vice president of operations and a senior in Questrom, said attendees had time to network and hold individual discussions after the presentation. This is the second time herNetwork has welcomed Accenture to campus. 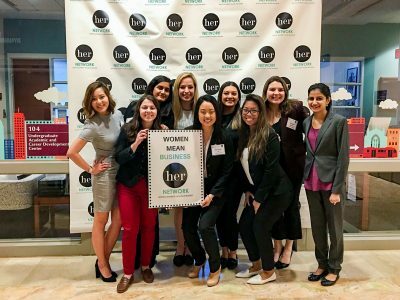 According to Minna Tang, president of herNetwork and a senior in Questrom, the session held Tuesday was scheduled in October and carefully planned so attendees could learn more about the company and potentially apply for an internship. HerNetwork has previously helped members prepare for applying to internships. “I don’t want to say we’ve been able to connect people with actual internships and jobs, but we’ve definitely helped people get their foot in the door because we give them that access to talk to recruiters and talk to current alumni who are working at those companies,” Tam said. The session was open to current herNetwork members and BU students of all majors. 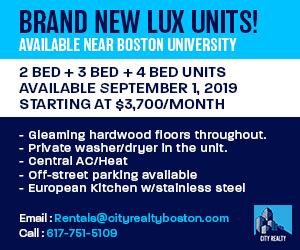 According to Danielle Edmonds, herNetwork’s vice president for marketing and a Questrom sophomore, herNetwork is always looking to welcome new members. Individuals can reach out via social media, email or in person. The club is also seeking to increase their social media presence, according to Tang. With accounts on Instagram and Facebook, they are seeking to better appeal to their audience. Tang said that in addition to networking and workshops, herNetwork provided social opportunities. In addition to the networking and information sessions in Questrom, herNetwork is next holding a Valentine’s Day Cards and Information session with PwC — an audit and assurance, tax and consulting company — and the annual Women Mean Business Conference in February. “It’s a really great way to explore different concentrations, as every week we have meetings with people from different companies so there’s finance panels, accounting, marketing and more,” Edmonds said. Tang said she joined herNetwork freshman year with the hope of finding a community. She quickly increased her involvement. Tang joined the marketing committee first semester of her freshman year, officially beginning her herNetwork career. Edmonds said the club allowed her to meet people with the same interests.